I was never a kid into arts and crafts. I stuck to video games, but, as Tearaway did on the Vita in its previous iteration, Tearaway: Unfolded meshes those two worlds together in a sweet little interactive bundle. The sheer creativity and vision Media Molecule (Little Big Planet, & the upcoming Dreams) brings to the screen is by far my favorite part of the game, it’s just so darn beautiful and interesting. I had a complete blast with the original game on the Vita. I heard great things about its sweet personality, creativity, and unique interaction with the back-touch, camera, and motion controls. All those came together very well and it was one of my favorite games back in 2013 and one I came back to a second time last summer just for fun. I, honestly, expected Unfolded to be a PS4 reincarnation of that game, and while that’s not the case in many situations, that wasn’t always a good thing. 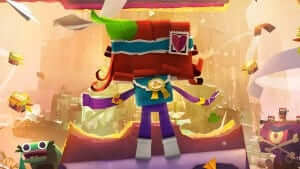 Tearaway has a huge, creative world to discover! In Tearaway: Unfolded you are YOU, yourself, but also a god-like figure in the sky who can manipulate the world. If you have a PlayStation Camera you will appear in the “rip” in the sky as the “YOU” character in the story. That’s where the fun interaction (on PS4 and previously on Vita) begins, you are a part of the story, and ultimately you are the “hero.” Manipulating the world around the character you control, Iota, is where the game begins to shine (no pun intended) and also struggle. You’ll meet tons of interestingly fun characters needing your help, and guiding you along the way. As you maneuver the paper-made world that Iota travels through. Media Molecule has created a game where literally every last bit of world is made out of paper. Features include the ability to print out and actually create items and characters from the game in real life. Amazing. I probably spent a good ten to fifteen minutes, each time I played the game, looking around Tearaway just to see what they thought up and created. From little shreds of paper falling, as rain, to massive paper mountains you climb. All the while, encouraging the creativity of the player as well. You’re consistently asked to make bit of the world from snowflakes, mittens, and even a coat of arms. All are immediately inserted into the game for you to see, your “works of art” shape the story and world around Iota. I, especially, appreciated those parts of the game that open up more. It does slow the pace down just a touch, but I found myself wanting to collect all of the confetti pieces I could so I could unlock as many outfits and crafting options as possible. You can befriend characters around the world, use your different abilities to find and unwrap presents, or even snap pictures of scenery that have “lost their color” to gather the in-game currency. The core gameplay is fairly simplistic, as far as 3D platformer video games go. There are some decent puzzle areas later in the game that will make you stop and think, but not for very long. However, that is no knock on the game. I found it kind of nice to have to stop in certain locations for a while, instead of moving from one to another fairly quickly, to enjoy the view. The main trouble Tearaway gets into is the controls and implementations of the DualShock controller’s capabilities when fending off enemies. Literally, everything made out of paper! However, I don’t fault the developers for the shortcomings of the motion and DualShock controls; it’s just what hardware is provided. For example, while it’s pretty fun to cut-and-paste your own designs into the game, the small touch pad on the controller just doesn’t provide enough physical real estate to work with. My clouds looked more like pointy 12-pointed stars, a shape that should be a lot simpler to pull off and was on the Vita. More troubling is the interactive controls when fighting the Scraps (enemies) in the game. I think it’s another great idea to utilize the light on the controller, but the end result is more of a struggle than it needs to be. I found the game to be fairly forgiving, but the most difficult parts came when I was required to use certain aspects of the DualShock to eliminate enemies. Despite all of this, it’s still the best use of the PS4’s controller that I’ve seen, It utilizes everything possible in a different mechanic, be it big or small. 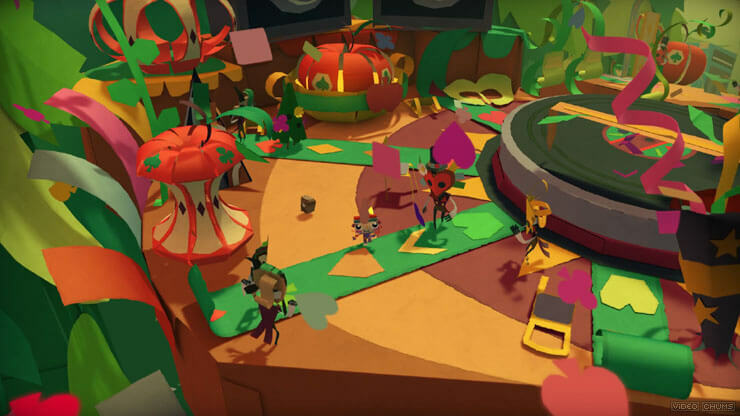 All-in-all, the world of Tearaway: Unfolded is something really special. The detail of every last bit of scenery and character is finely tuned to look like it has been hand-crafted. That, in itself, is worth the price of admission here. While the gameplay doesn’t always come together the way it should, it wasn’t nearly enough to take me away from the fun and inviting experience of playing. If you’ve ever been a fan of Media Molecule, the creativity and aesthetic alone, will please you. Especially with the larger environments and little corners you’re encouraged to explore (tons of unlockables!). I had a great time taking in the paper world around me and creating my own adventure hand in hand with Iota. Tearaway: Unfolded is an amazingly creative world to explore, with great interactive pieces that have various hits and misses along the way.